There are a lot of exciting things happening at DigitalChalk right now. The development, operations, and quality teams are very hard at work on a new release of the product coming very soon. Code named "Einstein", this release is packed full of feature requests from our customers. While we wrap up the open tickets and complete QA, I thought I would start giving a sneak peak at some of the features that are going to be included by writing about them here in my blog over the next couple of weeks. 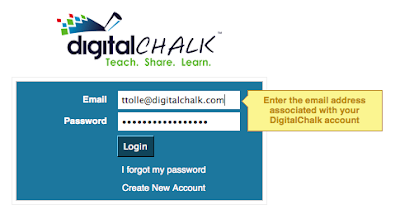 We have done a lot of work on the interface of DigitalChalk in the Einstein release. Immediately you will notice that we have changed the look to be much more streamlined. We had a couple of goals in moving this direction. First of all, we really wanted to be able to provide much more information on a single page to the instructor or student. This is really a challenge because we needed to balance between a page that feels cluttered and has too much information and keeping it "too clean" where the information cannot be found on the same page without navigating away. It is also important to us that Einstein is compatible with a wide range of browsers. Those of you that have done any development at all on the web know what a pain that can be. Something that works in Internet Explorer will not work in Safari, and something that works in Firefox will not work in Internet Explorer and that isn't even taking into account all of the different versions of the browsers. Sometimes this feels like a loosing battle for a complicated site. Page rendering time has also been an area that we have devoted significant resources toward. We are seeing an improvement now of over 500% on some pages! I will be including more screenshots in the future of various parts of the site as I talk about specific changes. We are all very excited about the changes and can't wait to push them out to you.